Example of symbolism from Eden's Womb- "6id" pronounced "six-id" is shorthand for "Seeks It", which is, in turn, an acronym relevant to humanity's end-time spiritual quest: the Soul's Emergent Evolving Knowledge Sustains, Impels, Transcends. 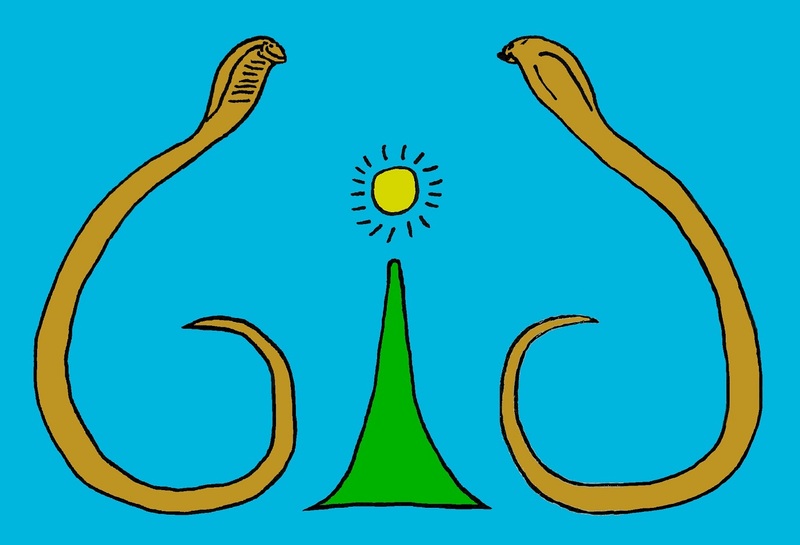 The snake imagery is fundamental to the story, and the central mountain with seventeen-rayed sun represent the destination of the epic quest--the 'Last Fell Capital of the Unpunished', DunCanon. Did you know that there is a religion known as Jediism, officially recognized by the US military, among other government institutions? Jediism began, of course, as pure artificial myth, rooted in the fictional construction of a venerable religious order in the Star Wars movie series. 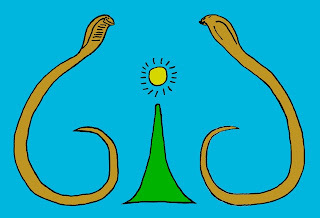 The art of building artificial mythology is called Mythopoeia, and it’s an important part of a good Fantasy and Science Fiction tale. Tolkien popularized the term when he wrote a poem with that title in 1931; and he was, of course, a master at the art. He formulated thousands of years of Middle Earth history and legend, beginning with a creation myth—much more than actually made it to the pages of the Lord of the Rings trilogy. For him, Middle Earth Mythopoeia was a passion and a life work. A more general term for this ‘research’ that Fantasy/Sci-Fi writers engage in as they develop their tales is ‘World Building’. I call it writing a ‘Back Story’—stuff about individual characters and their world that might never make it into the story, but which informs their motivations and actions. And since every culture is heavily defined by its founding myth and legend, I've paid much attention to Eden's Womb's Mythopoeia. I have extensive back story notes – enough to eventually write several ‘prequels’. It was forty years ago that I began work on what has become 'Eden's Womb', so in some sense it already has a rich ‘real’ history too. Since primal dawn I’ve conjured spawn, and into Chaos hurled. Now fly at need, my living seed—approach yon hapless world. There make from cloud an icy shroud—a clever snowflake guise. To scour the land with beacon’s hand—and seize their Chosen One.